I’m so excited to have my first guest feature on A&L 🙂 It’s a segment that I’ll be sharing regularly as I believe we all have something we can learn from each other, as women and mothers. 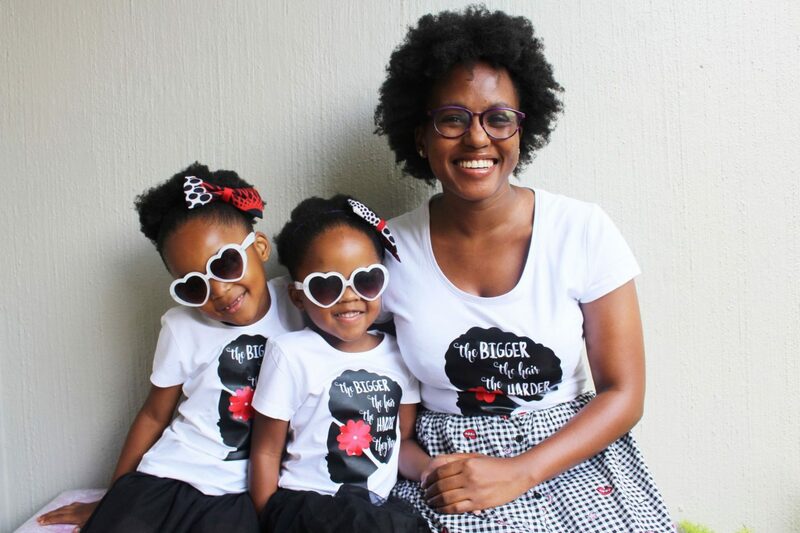 First up is Anita Boxoza, mommy to the adorable Miss K and Nini and the blogger behind Chocolate Hair Sisters. 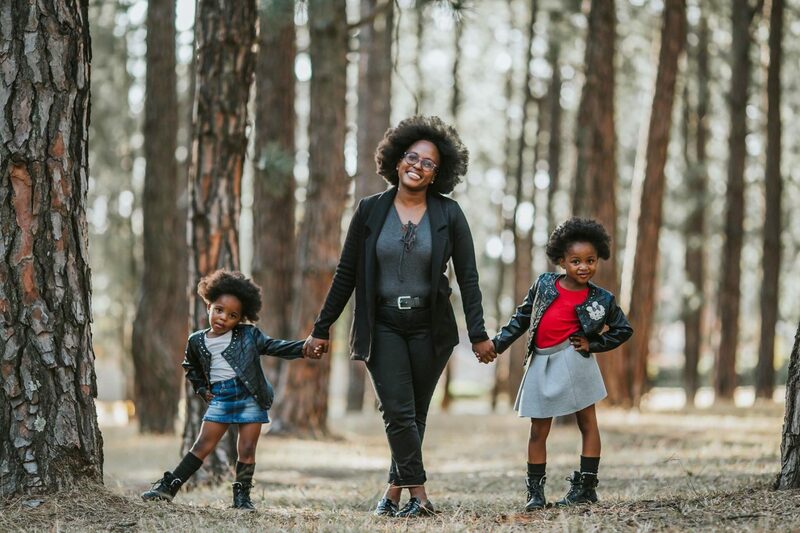 If you’re a mama looking for styles and tricks to maintaining your children’s natural hair, check out her tips below. Hi Anita! Please introduce yourself to my readers. Hello readers! I am Anita; wife, mom, IT professional and serial DIY-er! I generally keep to myself and I like to think of myself as shy. I can’t live without my earphones! I like blocking noise out and my earphones are perfect for that. I have a weakness for pasta, it is my absolute favourite thing. Oh and rainbow cake, I love rainbow cake! I am natural because that’s the way it grows out of my head. It was a decision I had made myself 13 years ago. My mother had decided she no longer had money for my relaxer touch ups, so I was forced to make a plan. I would visit the salon just for a wash and a blow dry as it was cheaper. She also used to tell me so many times how beautiful and fuller my hair was when it wasn’t relaxed. She doesn’t know it but her words, as simple as they were, made a huge impact on me. 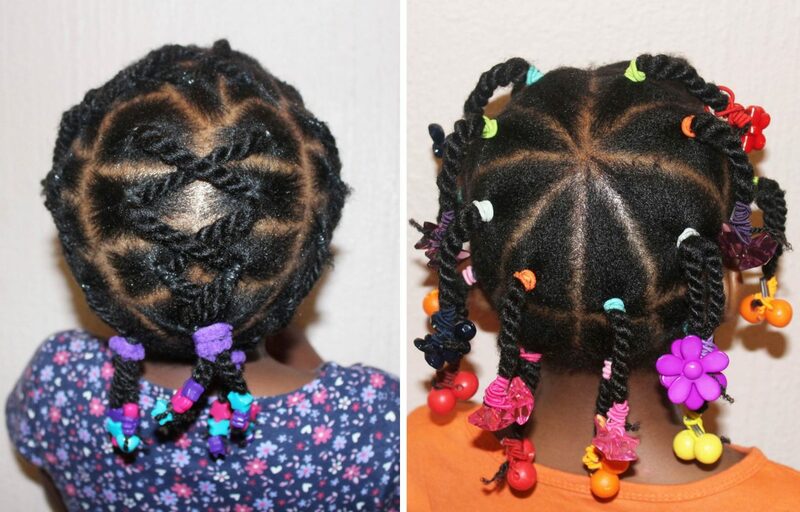 What made you decide to keep your daughters’ hair natural? I was natural, so it was business as usual for them too. My eldest’s hair has been relaxed once and we immediately did the big chop to start afresh. It is a decision I hope they will choose when they are older. Please share your children’s hair routine. Daily – We moisturise and seal at night. We use our satin sleeping caps every single day! Weekly – We have wash day weekly or bi-weekly. Here we do the full wash day routine: shampoo, condition, deep conditioning treatments, moisturise and seal and then lastly do a protective style. Our protective styles are usually chunky and easy styles which are quick to do and quick to take down. Monthly – We trim monthly or every six weeks. We also do a monthly hot oil treatment and have recently added a monthly steam treatment. Do you or did you face challenges when it came to taking care of their hair? What were they? If not, what’s the easiest thing about hair maintenance? In the beginning, I did what worked for my hair thinking it would work for them and that was a big mistake which cost us length and healthy hair. As a result, the girls had to have a few big chops to remove the damaged hair. This is where they both started learning health before length. For example, with my own hair, I blow dry it easily with no heat damage and I assumed theirs would be the same and we used to blow dry before plaiting. It’s a lesson we all learnt the hard way and now no longer do that. Their hair is now so much thicker and stronger because we do not use heat. The other thing that took us awhile was finding products that find work for both girls and I have found that they have to have different products to achieve healthy hair. I think it becomes easier as you go! We now go through wash day fairly easily with no fuss and it goes much quicker than it did in the beginning. You’re a busy working mom, how do you make the time to properly take care of their hair? I think routine makes it easy. You need to set up a routine and stick to it! Doing your moisturising the night before so that in the morning you do not rush through it is key. Also, you need to pick a day for wash day and stick to it, life permitting. If you find weekly wash days are not feasible, bi-weekly is also a good idea. And if all else fails, take the time to find a salon you trust that you can visit when you are in a pinch. Sundays are usually our wash day. In the afternoon when we’re winding down is the best time. I find this sets the tone for our week as the girls know the next day is school and they need to get their hair ready. If we have commitments on the day we do simple styles but styles that will last the week. The whole family needs to play a part in the routine so everyone can help if need be, eg. get snacks for the kids if Mom is still busy with their hair. What hair products do you use and what do they use? 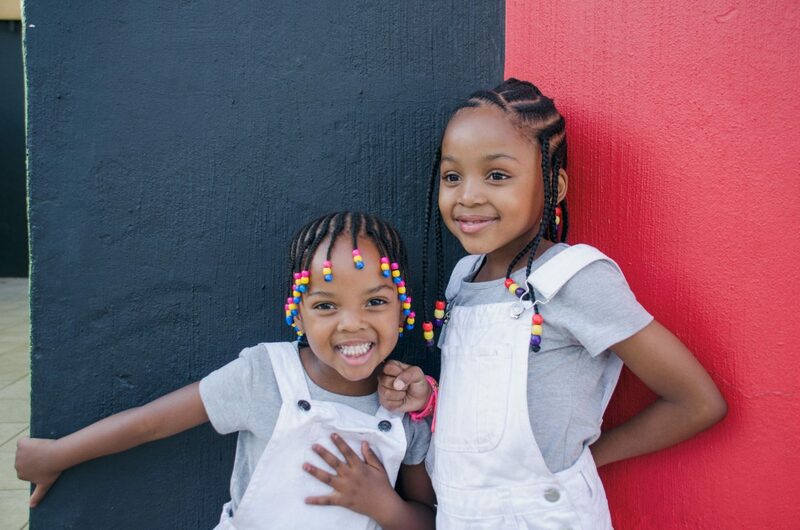 The girls are currently both using Afrobotanics Kids range which consists of a shampoo, conditioner, butter and leave-in, shea butter and olive oil. I take them to the salon for the treatments as I do not have a steamer at home right now. I use a range of South African products namely Nilotiqa, Moisture Factory and sometimes use the kid’s products when I run out. I test their products on my hair first before they use them. 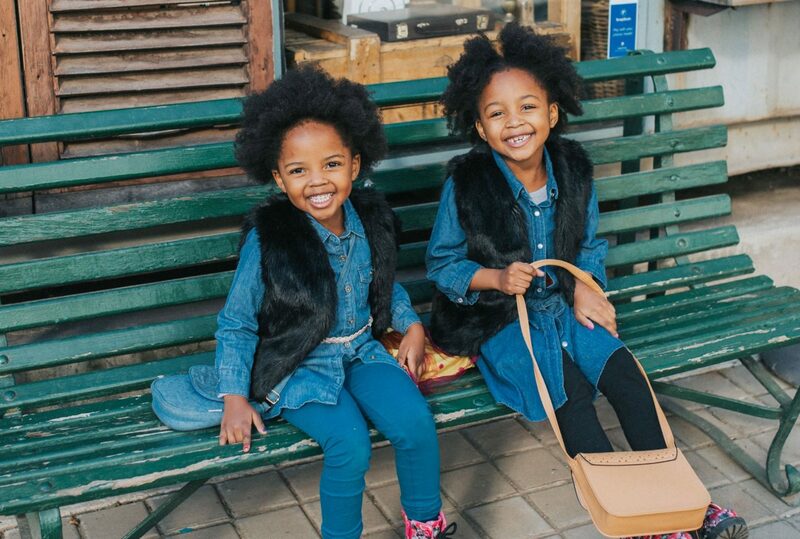 Can you share two easy styles you like to put your daughters in? What helps you get out of the door fast? These styles (below) literally take us 30 mins and we’re done. Cute and easy to do. Both girls are luckily open to the crazy hair styles I want them to try and generally ask for the colourful hair accessories and wool. What tips can you share with other mamas? First and foremost, your children must see you loving your hair before they love theirs. Speak only good things about them, their hair and yours. Don’t ever attempt to do their hair, whether by yourself, or at the salon, when the kids are hungry or sleepy. Recipe for disaster. Have fun with your and their hair. Show them what they can do and keep it age appropriate. Lots of hair accessories to keep things fun. Healthy hair before length, if the hair is damaged, it needs to go. Don’t try too much in one go. Perfect one style or technique at a time before moving onto something else. Thanks Anita! How adorable are these two cuties? 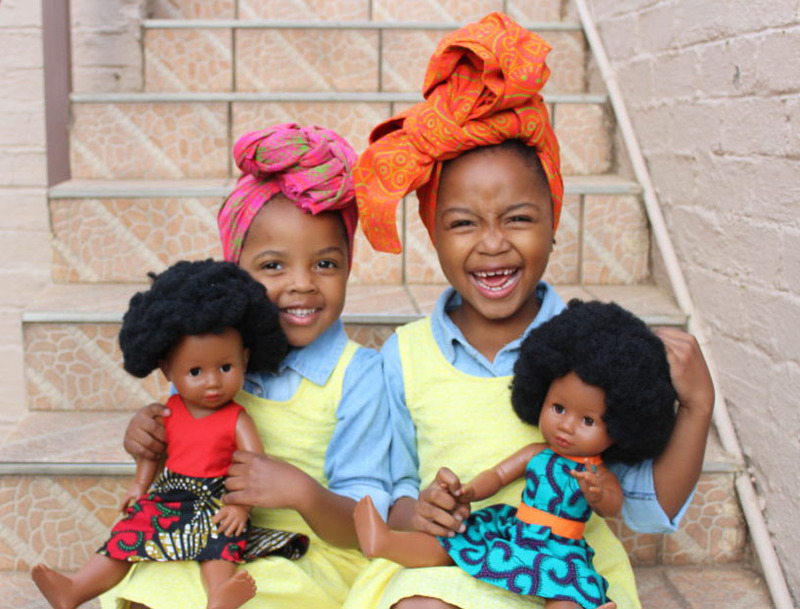 Please show them some love on the interwebs: Chocolate Hair Sisters Blog, Instagram, Facebook. They’re even cuter in person! What a lovely post. Looking forward to seeing more like this. Definitely pinning the pictures of the kids hairstyles, adorable! Where do you get your girls hair braided! I don’t think I have the time to donup dos and take them down every morning but if I can get a beat braid done for two weeks at a time that would help me make sure he girls are neat and also protect their hair. Hey Amanda, I’ll ask Anita on your behalf and will put the response here for others to also access. I am natural because that’s the way it grows out of my head… I will be uttering this statement to my daughter in the near future! Interesting series Mama Kai. Looking forward to more posts.